Working toward a safer, greener future. 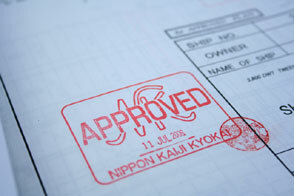 See why ClassNK has been the world’s leading classification society for over a century. To achieve this mission ClassNK will: Focus on delivering the highest quality classification services, by the highest quality personnel, while maintaining its totally independent third party, non-profit status. Focus on the development of relevant rules, procedures and guidance, and maintain and develop its commitment to scientific and technological research and development. Maintain and develop its global operations in line with the needs of clients using its services. 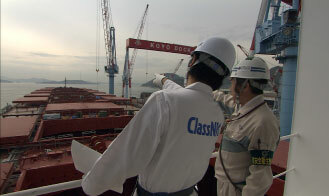 ClassNK has earned an outstanding reputation for its long-standing dedication to safeguarding life and property at sea and preventing marine pollution through the establishment of universally recognized standards for the design, construction and maintenance of ships and other marine structures. The principal work of the Society's expert technical staff is to undertake surveys to ensure that the rules which it has developed are applied to newbuildings and existing ships to ensure their safety. The rules cover not only hull structures, but also propulsion systems, electrics,electronic systems, safety equipment, cargo handling gear, and various other areas. ClassNK's surveyors work in shipbuilding and repair yards and at ports across the world, wherever they may be called upon to examine the condition of a ship. The Head Office is located in Tokyo and in Chiba, Japan, and there are branch offices at the major Japanese and overseas cities throughout the world. (see Contact us) As of the end of March 2019, the Society had 9,085 ships totaling over 252 million g.t. under class. This figure represents approximately 20 percent of the world merchant fleet currently under class. 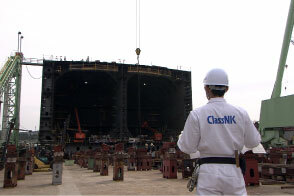 In addition to its classification survey activities, ClassNK conducts surveys on behalf of third parties including State administrations, offers technical services for offshore structures and onshore plants construction projects, accommodates requests for appraisals and engineering consultation, conducts research and development in various ship-related fields; provides quality-assurance certification of suppliers based on ISO 9000 and 14001 and OHSAS18001 series criteria*, and verifies the safety management systems of ship-management companies and ships, in accordance with the International Safety Management (ISM)Code and International Ship and Port Facility Security(ISPS) Code**. * As of the end of March, for ISO 9000, the number of registered suppliers was 498 while for ISO14001, the number of registered suppliers was 133 and for OHSAS18001, the number of registered suppliers was 34. ** As of the end of March, for the ISM code, the numbers of registered companies and vessels were 737 and 5,897 while for ISPS code, the number of registered vessels was 5,343.